The Cubeb-yielding plant is not unlike the pepper plant, and belongs to the same family. The two resemble each other in general habits in the form of inflorescence and in the fruiting. Cubebs were known to Arabian physicians as early as the ninth century, who employed them as a diuretic in kidney troubles. 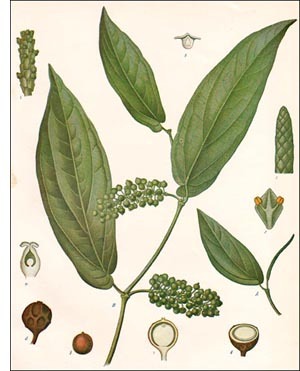 It was also known at that time that Java was the home of the plant. During the twelfth and thirteenth centuries it was employed medicinally in Spain. Originally it was doubtless employed as a spice, similar to pepper. At the beginning of the nineteenth century cubeb disappeared almost entirely from medical practice. About 1820 English physicians of Java again began to employ it quite extensively. As in the case of black pepper, the fruit is collected before maturity and dried. The fruit is about the size of the pepper, but has a stalk-like prolongation which distin-guishes it. The pericarp becomes much shriveled and wrinkled on drying. Cubebs are cultivated in special plantations or with coffee, for which they provide shade by spreading from the trees which serve as their support. Their cultivation is said to be easy. Cubebs have a pungent, bitter taste and a characteristic aromatic odor. It cannot readily be confounded with any of the other more common spices. Its use as a spice is almost wholly discontinued. The use of cubebs in medicine is also waning, since it evidently has only slight medicinal properties. It is used in nasal and other catarrhal affections. Cubeb cigarettes are used in the treatment of nasal catarrh. It has a marked influence upon the kidneys, causing irritation and increased activity, and, as already indicated, it is, therefore, a diuretic. It is, however, harmful rather than beneficial in acute inflammatory conditions of these organs.